Colin had left early yesterday morning to head back to Freightliner with the RV. I was just falling asleep again when the phone rang at 7AM. It was Freightliner saying that their day was full and could we come next week? I said that Colin had already left plus our insurance was running out very shortly. I also gave him Colin’s cell number. I had a long list of things I needed to do before Colin got back with the RV and then we had to go out and do some errands including pick up the printed statements from the bank. 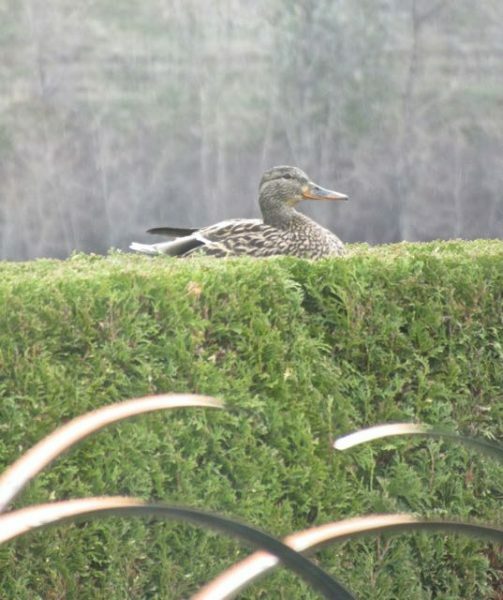 This duck was just hanging out on top of our cedar hedge. It appeared so very relaxed. I got there in one piece and we did our shopping. Sadly there is no romaine to be had due to some weather issues in Arizona. Might be another two weeks. Good thing I had three heads with me from the US. We will be eating well for the next week at least. 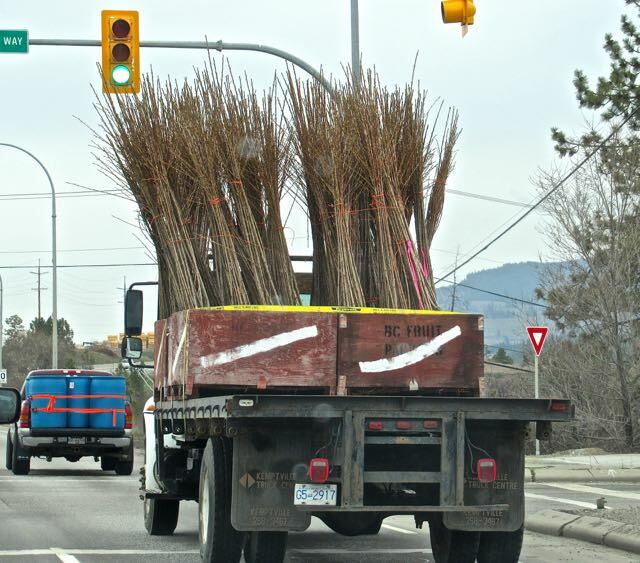 Tiny apple trees heading off to be planted in some orchard. 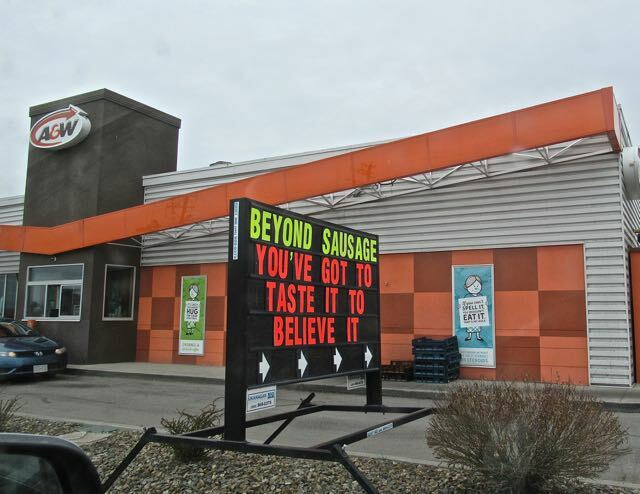 When we left the new veggie burger, beyond meat, had come out that tasted like meat and now they have beyond sausage! What next? We headed back to Lake Country, picked our copies up from the bank and bought some wine which hopefully will last a week 😳 We tried to find a place to drop off a large bag of used clothing but they are no longer there. So many changes since we left last September. 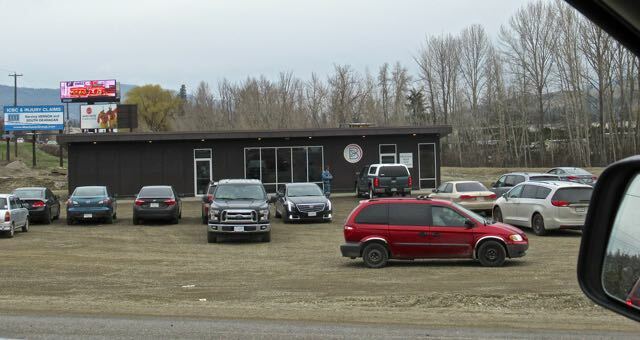 Including this cannabis store which is right off the the corner of the highway and Commonwealth Road which is the street leading to our RV Park. They are doing some very brisk business with all the cars leaving and others turning in. It will be interesting to see what it is all about and how it will affect the neighbourhood. We finally got home and I was able to get a few things done on my to do list while Colin did some chores as well. I have finally completed my laundry, all fourteen loads. Now we have our floor space back. I even had a few minutes to spare to prep some goodies for our happy hour. I have really been racking up the steps just by being inside these last four days, over 8 thousand steps twice and six thousand twice, lots of house walking in my small abode. 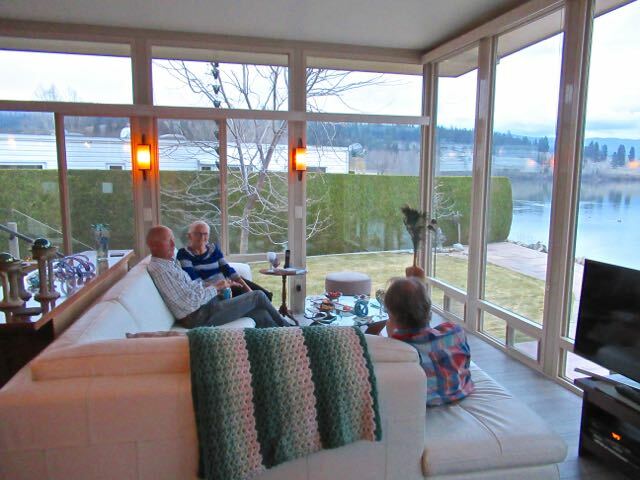 Sharon and Jim are blog readers who are full timing in their Class A diesel pusher. She was reading me years back when I was back in Edmonton ( where they summer ) looking after my father before he passed away. They have been together since 2008 ( ??) and have travelled quite a bit in the US and even all the way down to Lo de Marcos one season. We talked and talked and shared many RV stories and adventures. 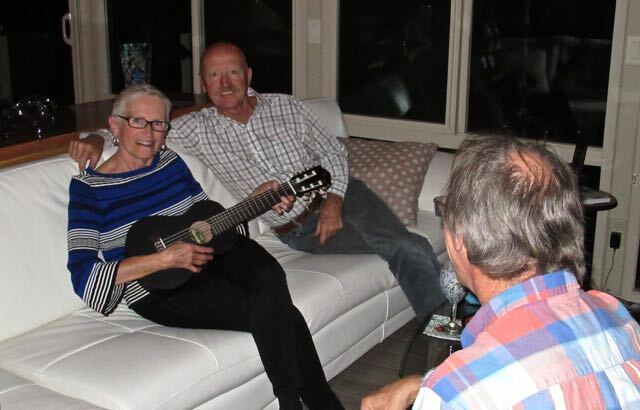 Colin played a few tunes and then I pulled out the Guitalele to show Sharon. She plays the mandolin. From that bit of music we moved onto dancing of which they are dancers as we are. Such fun to be had with this couple. However they are off tomorrow and will be back to their RV park near Edmonton by early May. It was sad to say goodbye but after a five hour ‘happy hour’ we were all tired. I was supposed to mention the other day that our RV still has 80% left on the front brakes and 70% left on the back, pretty good for the original 2001 brakes. With the rush in packing up before we left Mexico I neglected to put something on my shop in the US only list, to buy on the way home. This is a small food item ( non refrigerated ) that can only be purchased at Walmart in the US. So if you are still heading North and will passing through Kelowna could you send me an email if you are able to help me out. Much appreciated. Hope you all had a wonderful Saturday. Know I did, more about that tomorrow. At least it’s only drizzling at home, we are having heavy rain and did have heavy winds for most of the day. I can’t wait to get home and see all the changes. And I know what you mean about hopping in the car after not driving for six months, it always makes me a little nervous the first time I go out on my own when we get back. The weather is a mixed bag for the next week. I hope it all works out for you. It never got above 52F yesterday and so far we are already at 55F this morning so it will be a warmer day. Nice that you can get your coach fixed up before you store it. 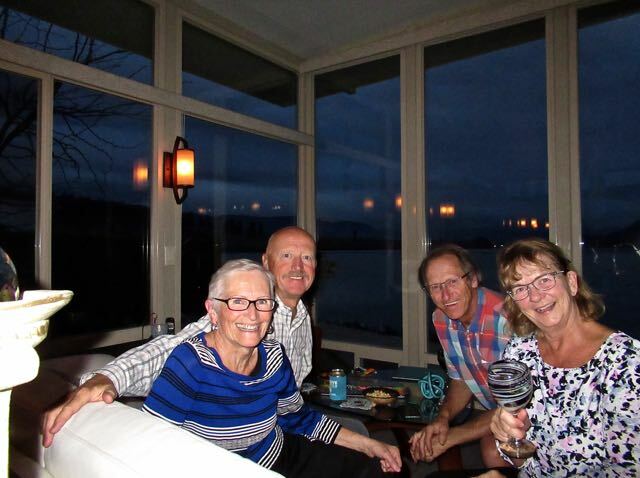 Also you can always count on fun times with Jim and Sharon what a super couple.We enjoyed a few happy hours with them last fall. That way it is all ready for us to load and head out in the fall. Colin is usually working the months before we leave so this works for us. Jim and Sharon are very sociable people. I was wondering why no romaine at Costco – but our superstore has both regular and organic romaine this week so you might try popping into one. We had 2 days of super heavy rain (needed) but today it is sunny again. Weird that freightliner may have to make exhaust, you would think that those parts could still be purchased. Our RV is a 2001 so some parts are no linger available. Thanks for the info re romaine at Superstore. Its on the list. What a lovely view u have in your living room!!! Thank you and the best part is that it has always changing based on weather and the wildlife. Our five hour “HappyHour” was so much fun and went so fast. Great to meet you and share our stories! It truly was a great evening. Hope to see you down the road. Meanwhile safe travels today.